Its trade ports date back to the 1st Century. Tens of thousands of animal species call it home. 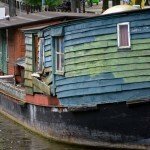 The rivers and canals are its lifeline. 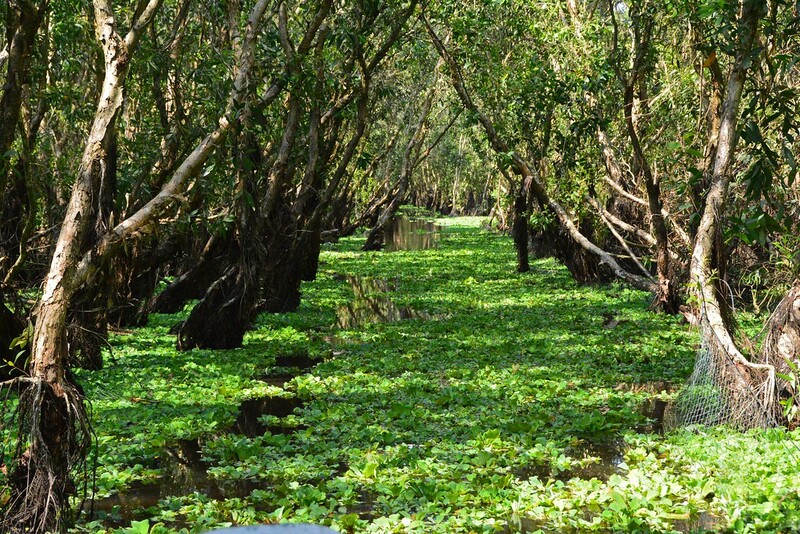 Welcome to the Mekong Delta in Vietnam. 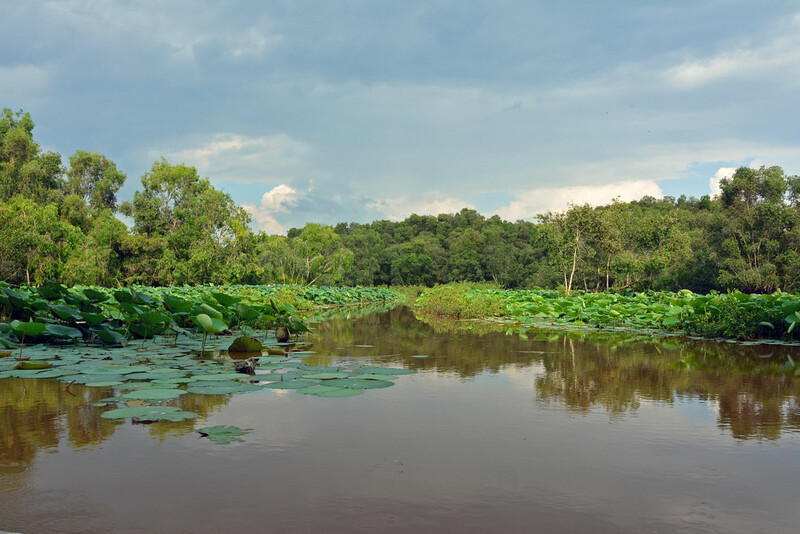 This culturally rich region deep in the south of Vietnam thrives on the abundant waterways streaming from the Mekong River that runs south from China before terminating into the sea. 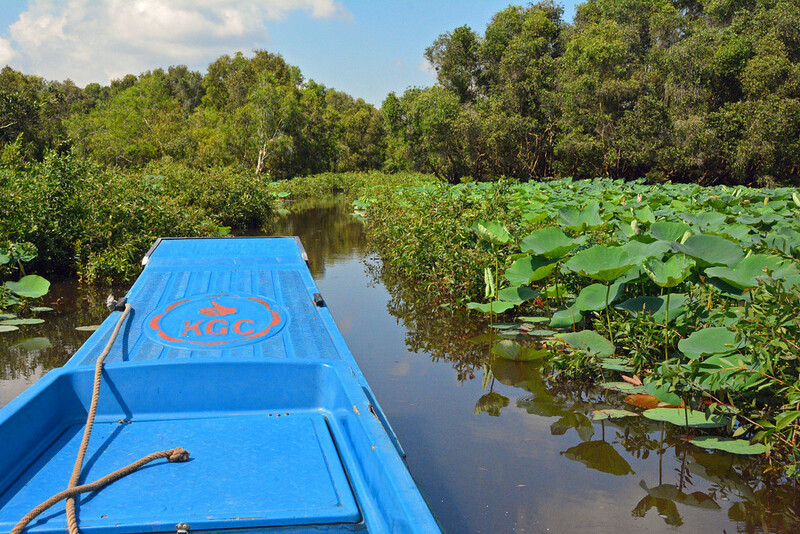 In keeping with our desires to explore the roads (or in this case, rivers) less traveled, we stayed in Nui Sam as we started our exploration of the Mekong Delta. Nui Sam is located just 4 miles (7 km) from the bustling town of Chau Doc. A rejuvenating 3-day stay at Victoria Nui Sam Lodge was just what we needed after a busy week of exploring ancient temples in Cambodia. 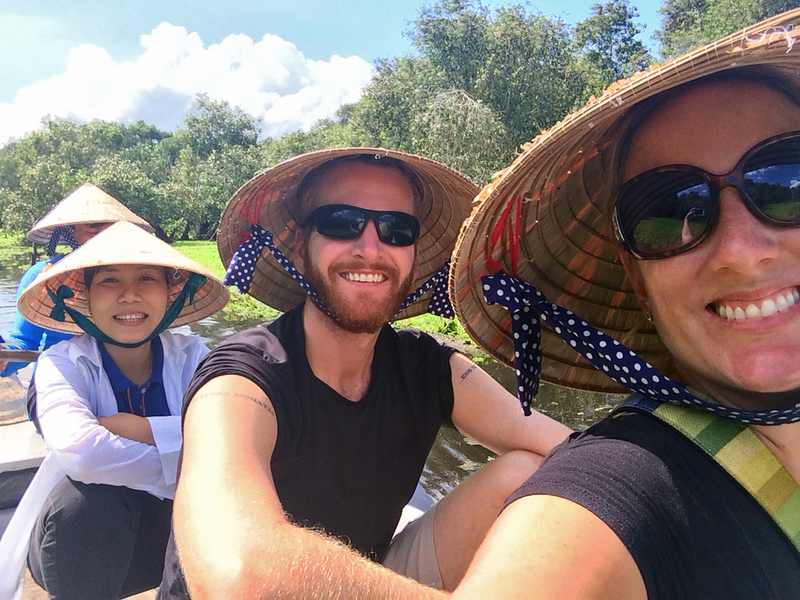 Though relaxing by the pool certainly had its perks (and amazing views), it was time for us to get out yet again and explore the natural beauty in the Mekong Delta! We met up with a guide from Buffalo Tours to experience the full-day Mountains, Monasteries, and Bird Life tour in and around Chau Doc. Too often people travel to foreign lands just to ‘see the sights’ and rarely interact with locals beyond ordering a meal at a restaurant or hailing a taxi. 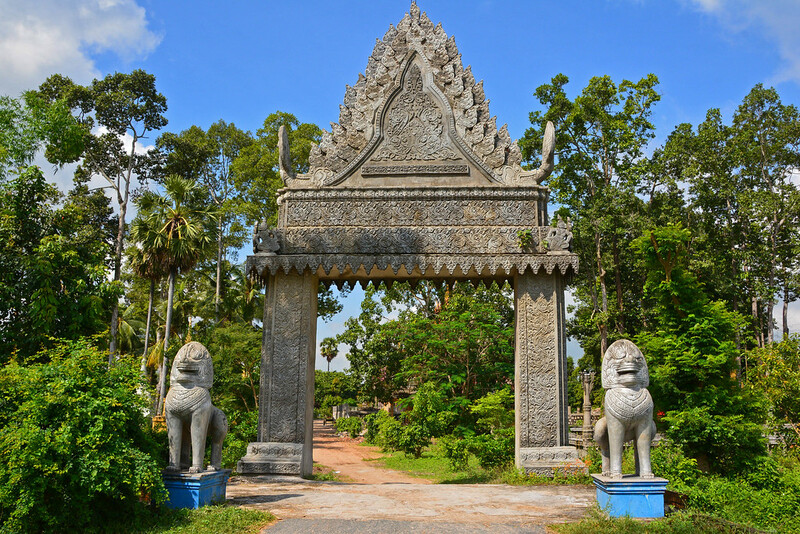 What we loved about this particular tour was that it started with a visit to a local Khmer ethnic village. The locals were genuinely excited to meet with us and welcome us into their home. 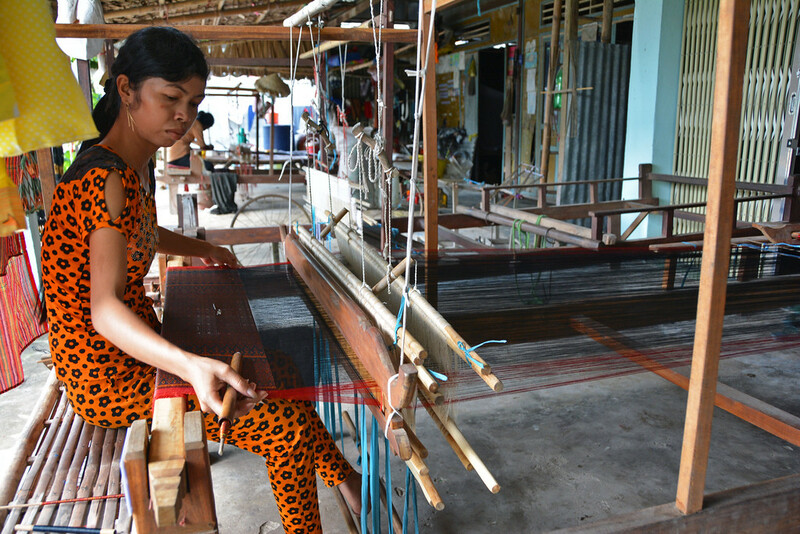 Many Cambodians (Khmer) still refer to the Mekong region as ‘lower Cambodia’, and to this day, there are a large number of Khmer ethnic minorities living in the Mekong Delta region. 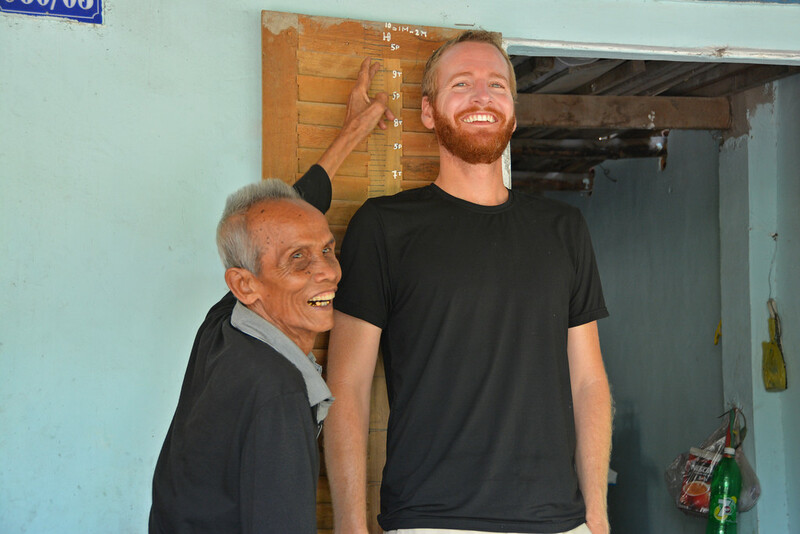 This local Khmer man was quite impressed with Sam’s height! 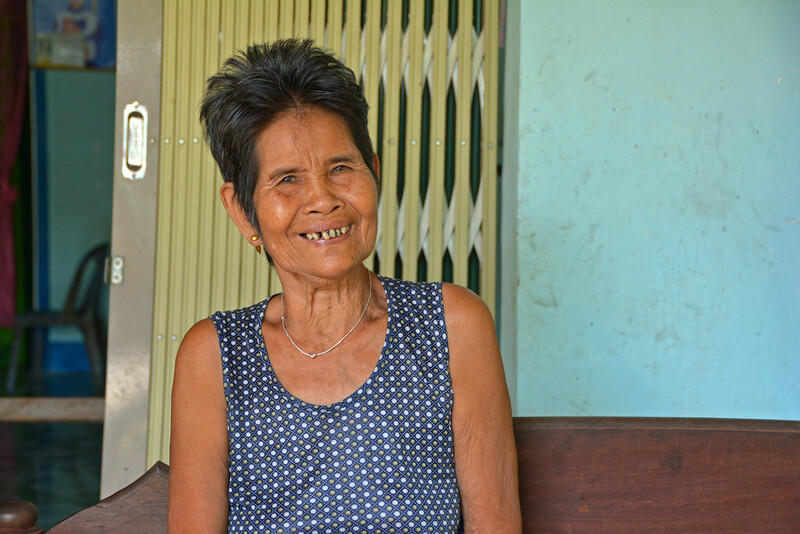 They didn’t speak much English, but our guide Tu acted as a translator when she could (as they spoke Khmer, not Vietnamese). We sipped on herbal tea together as they admired our ‘high noses’, which is considered a beautiful feature in their eyes. We relished the opportunity to watch the youngest daughter perform her trade of traditional weaving on a loom before moving on to our next stop. So much attention and precision goes into creating this beautiful handicraft. 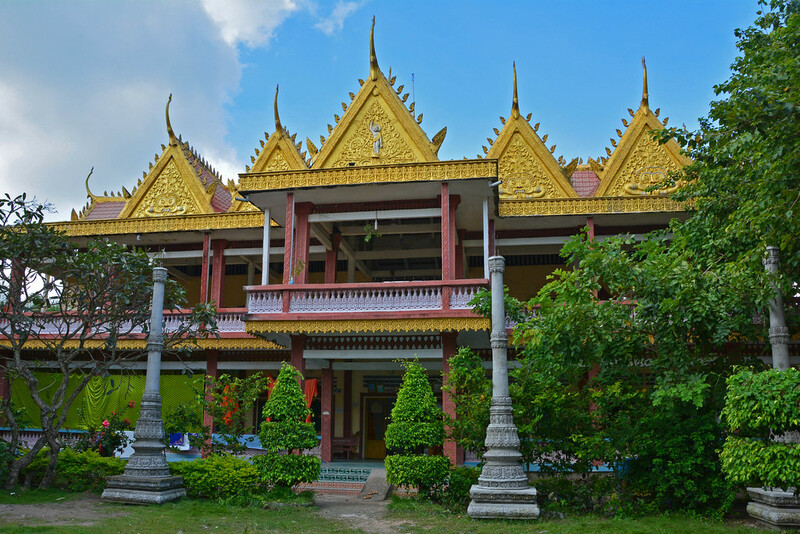 Just a few minutes down the road from the village we came upon the Van Rau Pagaoda, a Buddhist monastery. 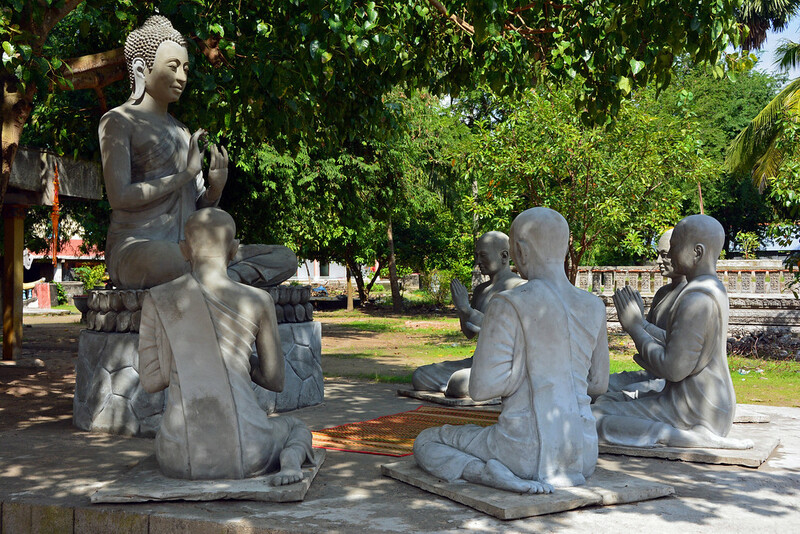 Because of this region’s Cambodian influence, the Khmer monks here practice a distinct form of Buddhism, different from that of a traditional Vietnamese monk. As we stood admiring this statue, a woman entered the center, kneeled on the mat, and performed an offering of gratitude. The grounds of the monastery were peaceful, minus the one beggar who approached us immediately as we arrived. Otherwise, it was just us and a handful of individuals, including a few Khmer monks, walking around. 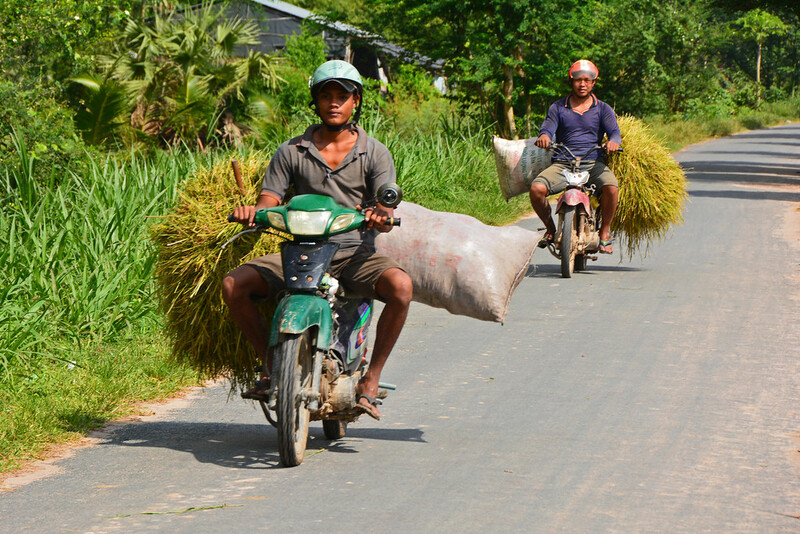 All too soon, we left the Khmer village behind, but excitement grew as we drove to the next destination on our tour. Motorbikes whizzed by, many carrying more cargo (and passengers) than you would think they would be capable of transporting. 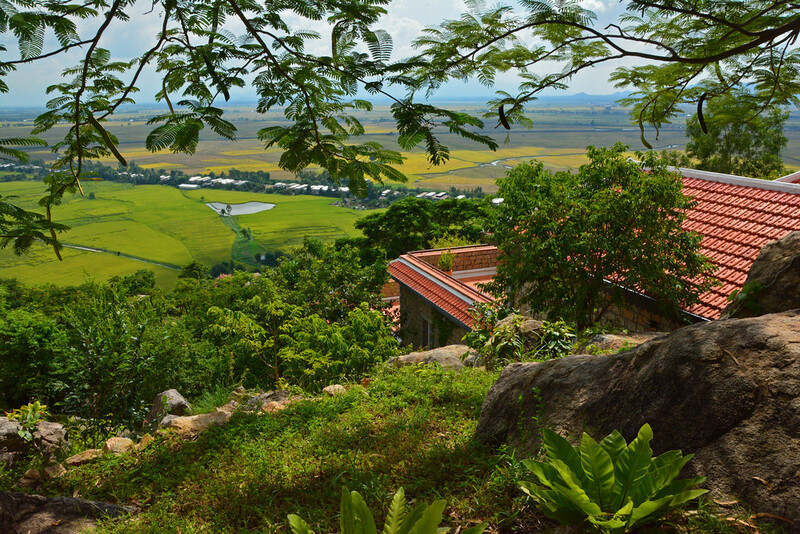 The countryside of Vietnam is beautiful, lush, and vibrant. We considered the transportation time during our tour as a highlight in itself! After about 30-45 minutes, we arrived at Tuc Dup Hill, an iconic war site. 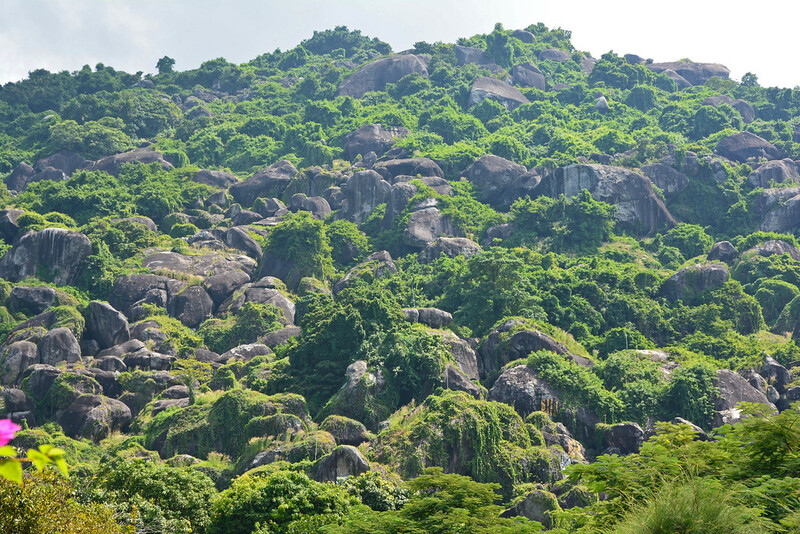 This hill is also known as $2 Million Hill, because reportedly the US spent $2 million trying to destroy this Viet Cong stronghold, though they never did. 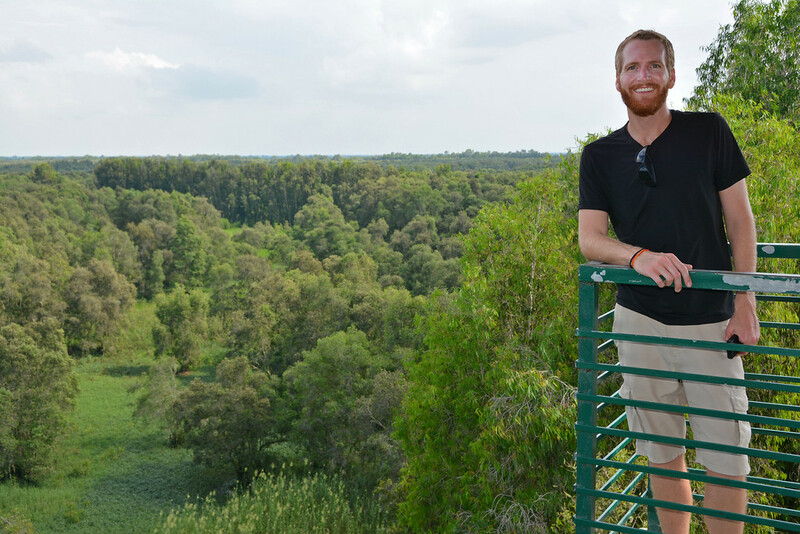 The plan was to climb through the series of small caves leading to the top of the hill where we would have the opportunity to talk with a Vietnam war veteran. Unfortunately the caves were a little too cramped for our liking and we turned back after just a few minutes. We are both very tall people, so the series of narrow passageways and steep ladders defeated us in the end. We were extremely disappointed at missing out on the opportunity to hear first-hand stories about what it was like to live here during the war, but we simply couldn’t muster the courage and strength to continue up the treacherous hill. It did, however, make us realize how crazy the living conditions were for the Viet Cong members who spent months on end in the confines of this hill. Following our failed little ‘mountain adventure’, we sat down for some regional cuisine. 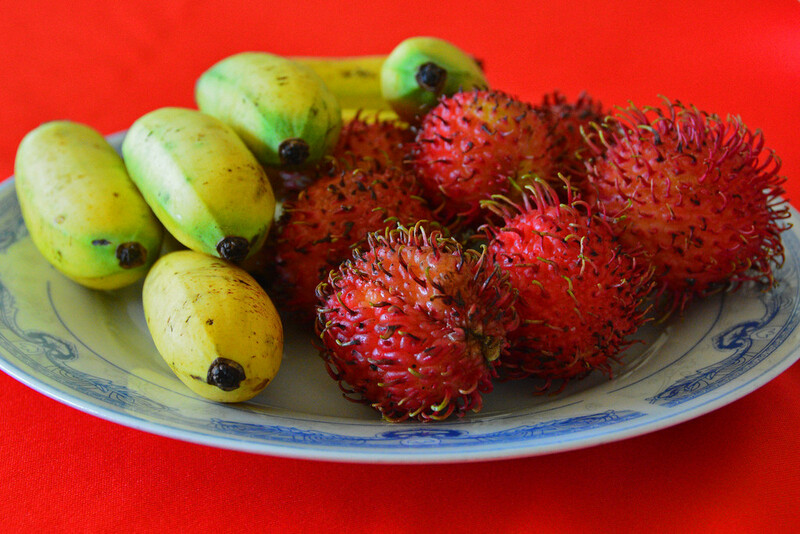 We were impressed from the get-go, as we got to try a new fruit for starters- rambutan. It’s known as chom chom, or “messy hair”, in Vietnamese. The multi-course meal we were served was flavorful and filling! We sampled a sour soup, fresh cooked vegetables, and delicious baked fish. Yum! 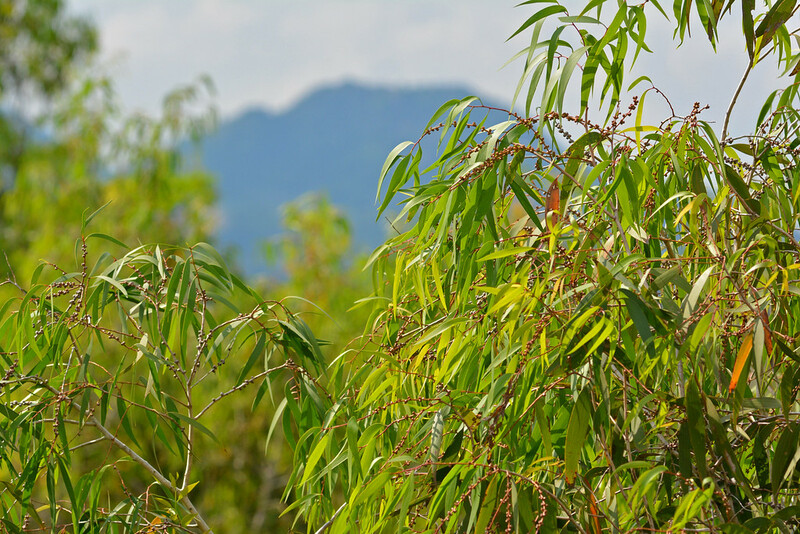 Our second to last stop, and probably our favorite of the day, was the Tra Su Nature Reserve, a flooded eucalyptus forest, and home to the Tra Su Bird Sanctuary. 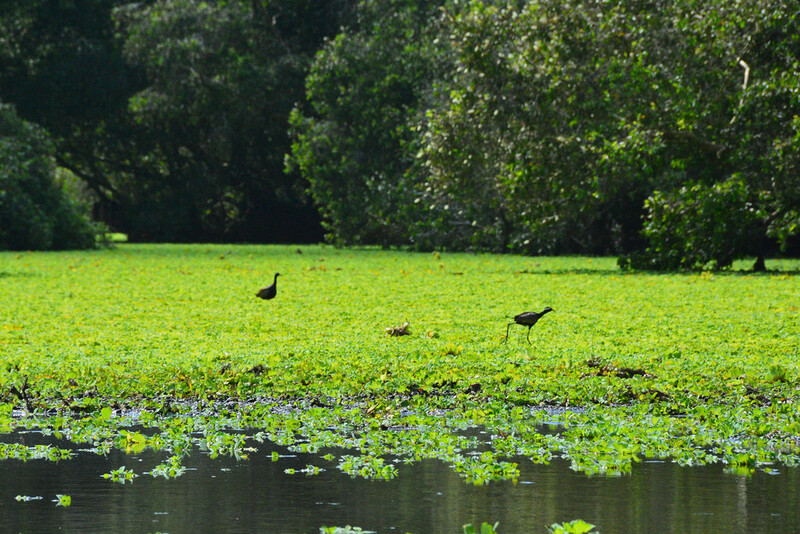 Here you will find Vietnam’s largest population of birds (over 80 different species), including egrets, storks, cormorants, and peafowl. 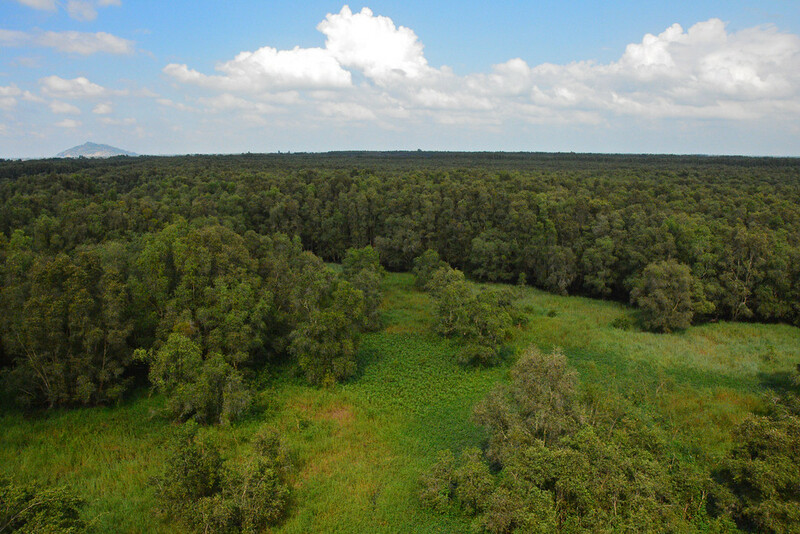 But, you certainly don’t have to be a bird enthusiast to fall in love with this luxuriant wetland. 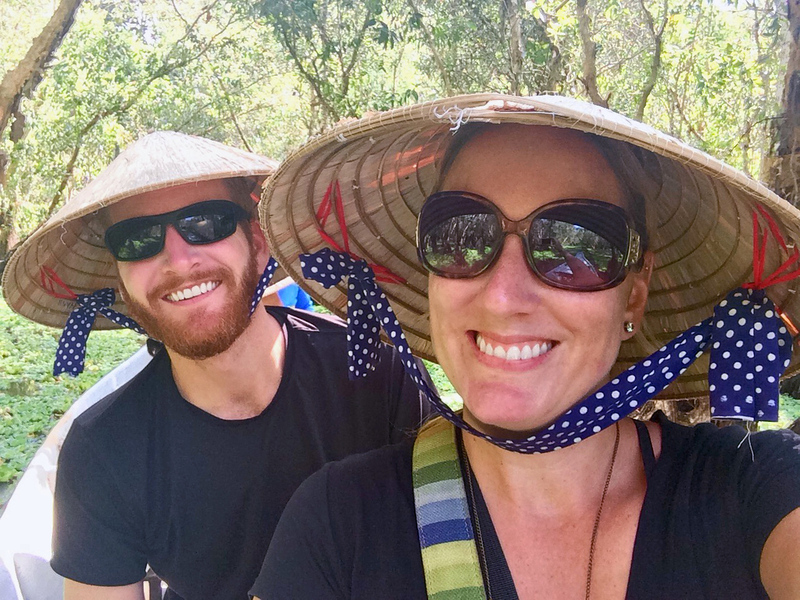 Wanting to feel the part, we donned traditional palm-leaf conical hats, known as a non la, as we cruised through the forest. 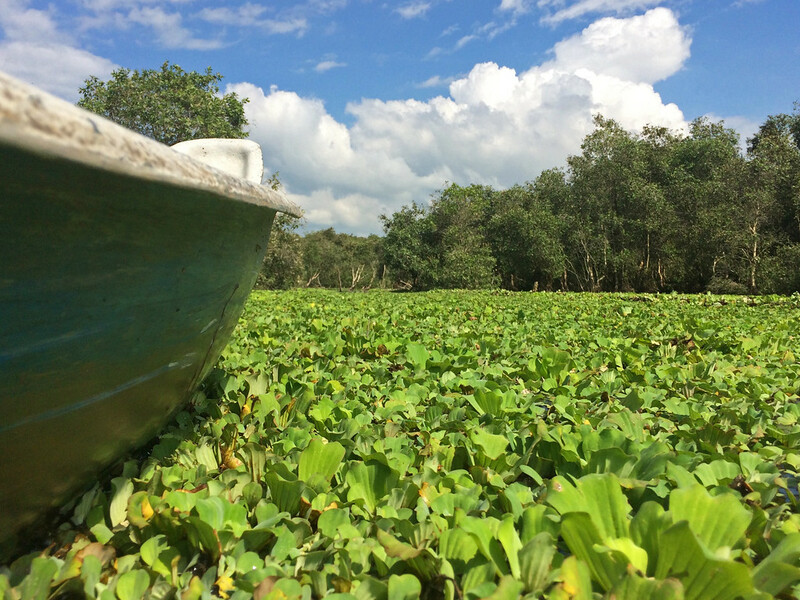 With chirping birds, and rustling tree leaves from a gentle breeze as our soundtrack, our favorite portion of the day was spent in a row-boat gliding over the thick water-logged vegetation. 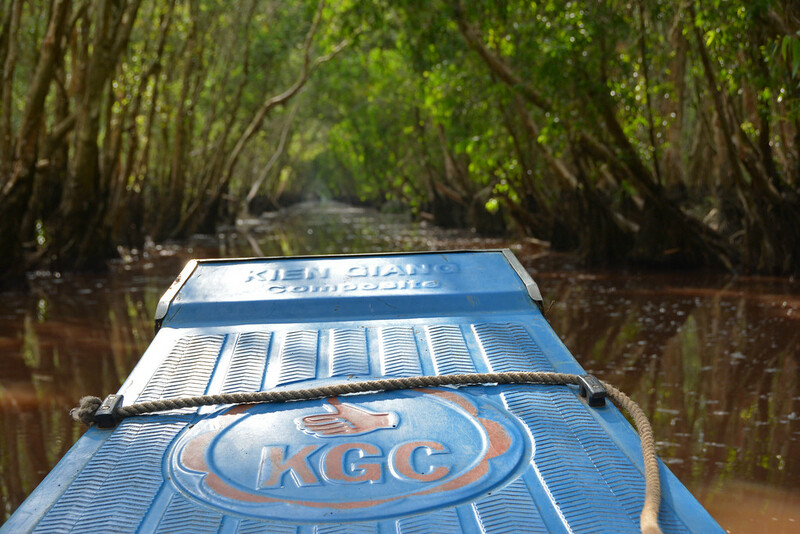 After hopping in another boat, we sped deeper into the forest to make our way toward the observation tower. 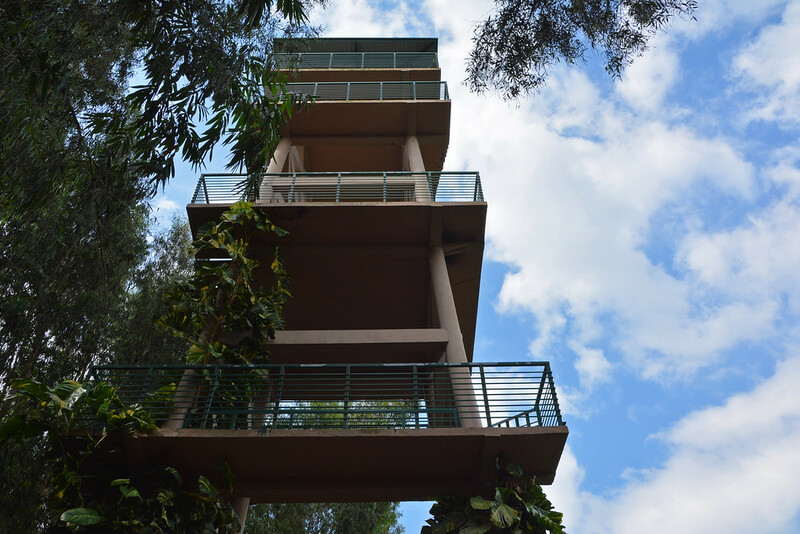 The tower provided breathtaking panoramic views of the forest below and Nui Sam (Sam Mountain) way off in the distance. 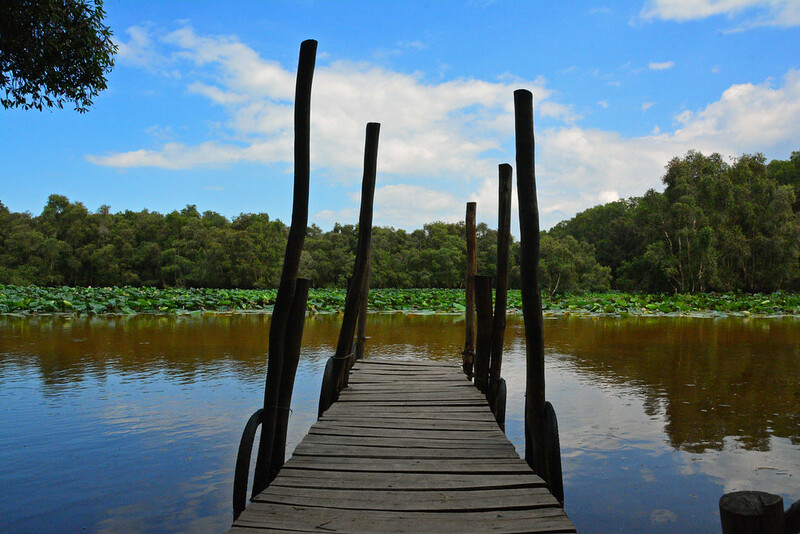 Tra Su is a nature-lover’s paradise. Throughout our visit, I was experiencing a constant internal struggle of “put the camera down and just enjoy it” and “oh my goodness, this scenery is unreal, I must capture it“! Fortunately I had enough time for both! On a boat heading back toward the exit… do we have to leave?! 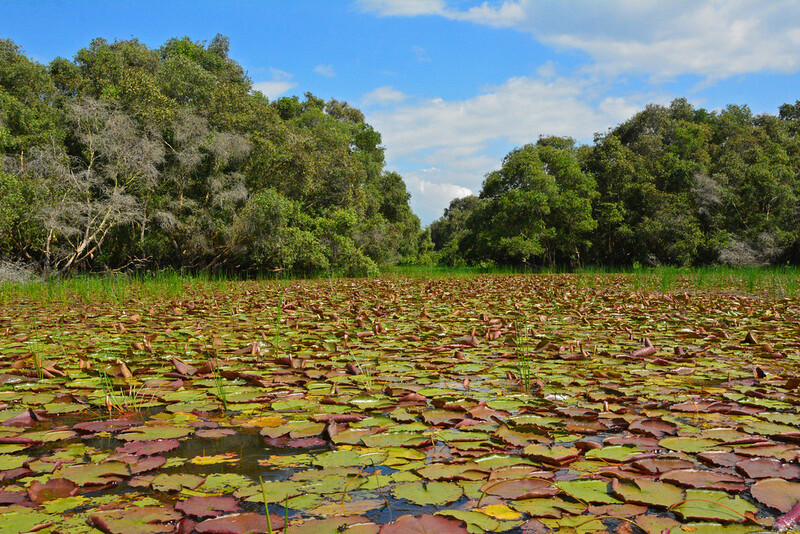 We can’t recommend a visit to this nature reserve enough! It’s the perfect way to escape the mild chaos from nearby towns and reconnect with nature! 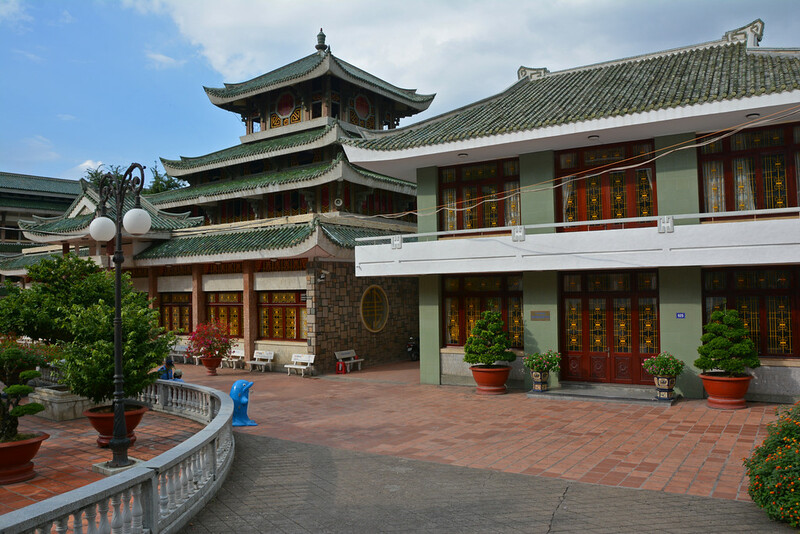 On our way back into town we stopped off at the Ba Chua Xu Temple. It was actually not a scheduled stop on our tour, but our guide Tu, a Chau Doc native, wanted to share with us one of the town’s most notable attractions. According to legend, in the early 1800s, villagers found a statue of a lady dating to the 6th century in the forest. They built a temple in her honor hoping that she would bestow upon them abundant crops and better lives. 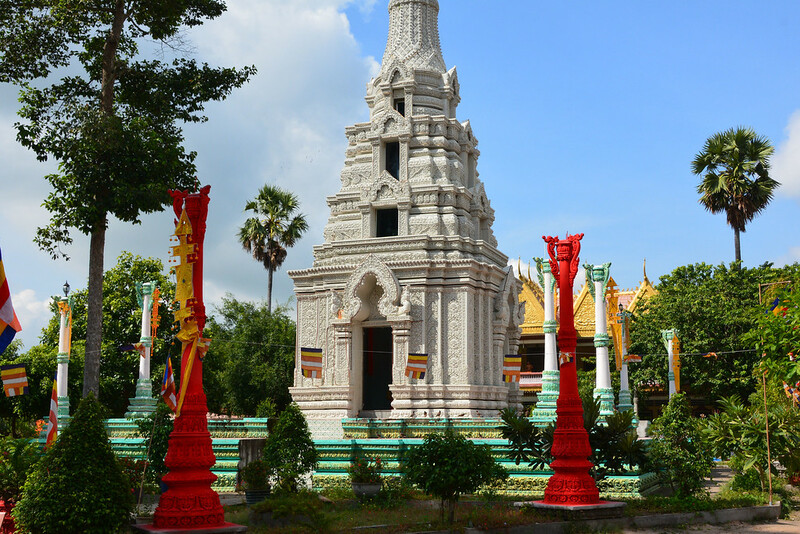 It is now one of the main religious sites in the Mekong Delta attracting thousands of religious pilgrims seeking a prosperous life. The day started at 8 am and ended around 4 pm. 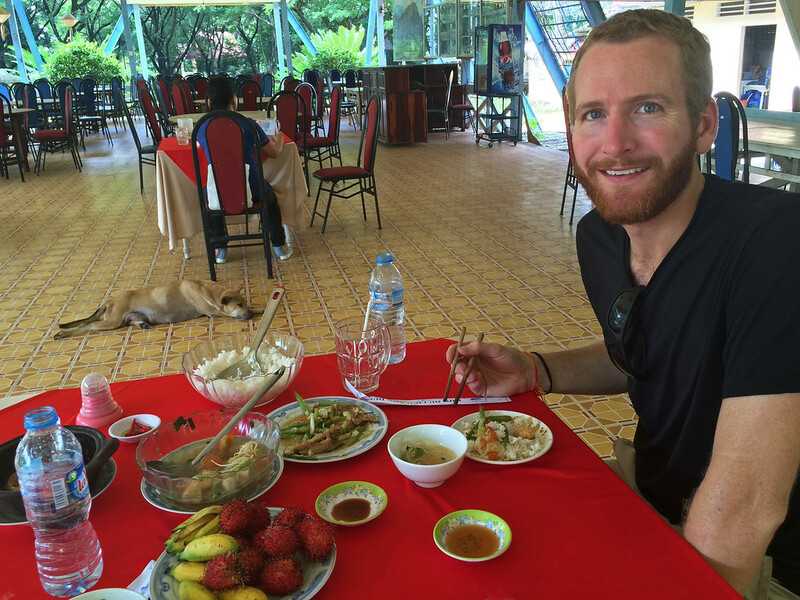 It included local experiences and cuisine, culture, tradition, and history. It was refreshing to be on a guided tour, but still feel as if we were having an authentic experience, as opposed to a touristy check-list of popular attractions. Our tour was provided compliments of Buffalo Tours, a leading travel company providing outstanding customized tours throughout Southeast Asia. They design expertly-crafted itineraries and tailor-made travel packages with the customer’s interests in mind and take it a step further to ensure their guests have enriching and cultural experiences during their travels. 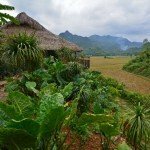 After our experience, we can highly recommend you look into booking with Vietnam’s Leading Tour Operator, as recognized in the 2015 World Travel Awards. 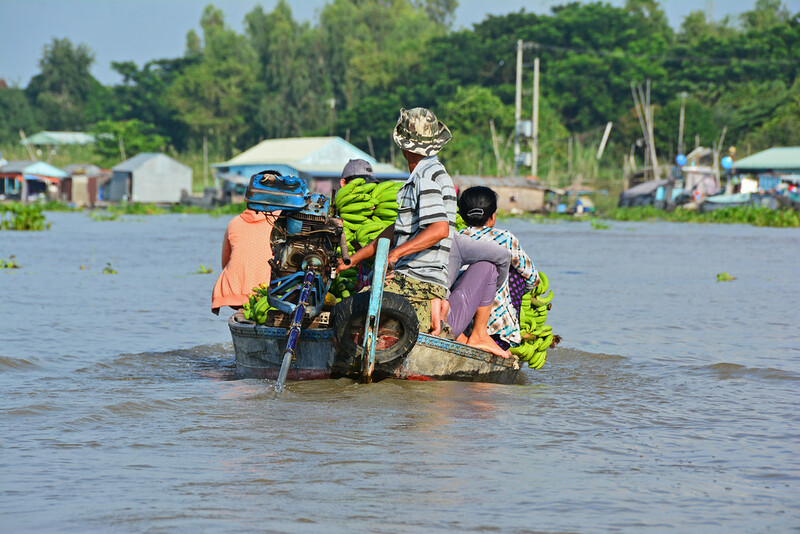 What a revealing look at the Mekong River and its people, Sam and Toccara! 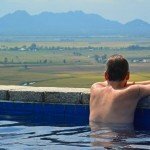 I have been considering a Viking River cruise on the Mekong for a while now, and your post and pictures have definitely heightened my resolve. 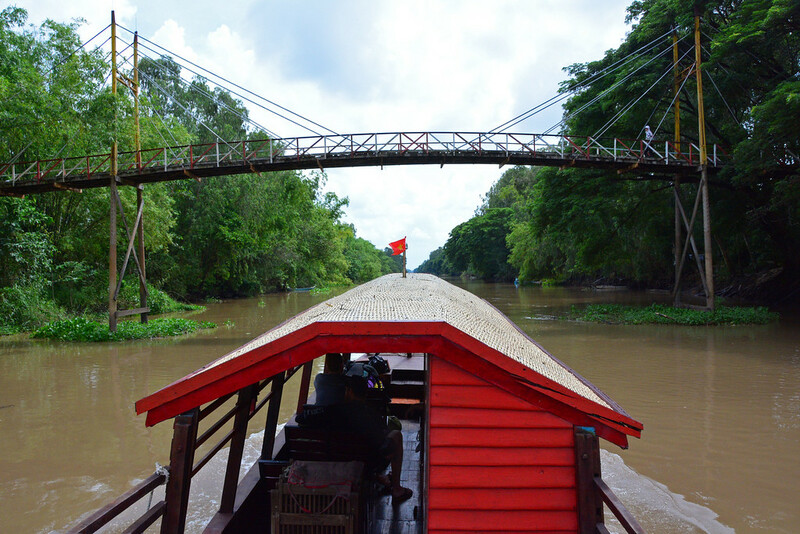 You definitely should look into a Mekong cruise, but be sure to also get off the bigger boat and onto a little boat to go through some of the smaller canals. That’s where the culture of the region can really be found! Wow. it looks beautiful! I really want to try a Rambutan now! Lucky! I’m going to have to look for rambutan when back in the States. I had never seen it before, but I’m definitely going to keep my eyes peeled! Another great read! Really like the photography, and the place, obviously. 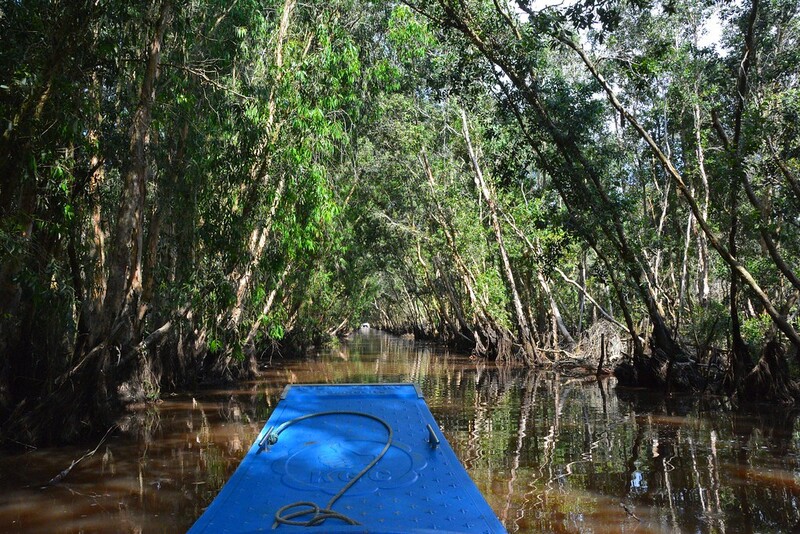 Saw a documentary the other day about the Mekong Delta and now recall some of it. I love all your photos! 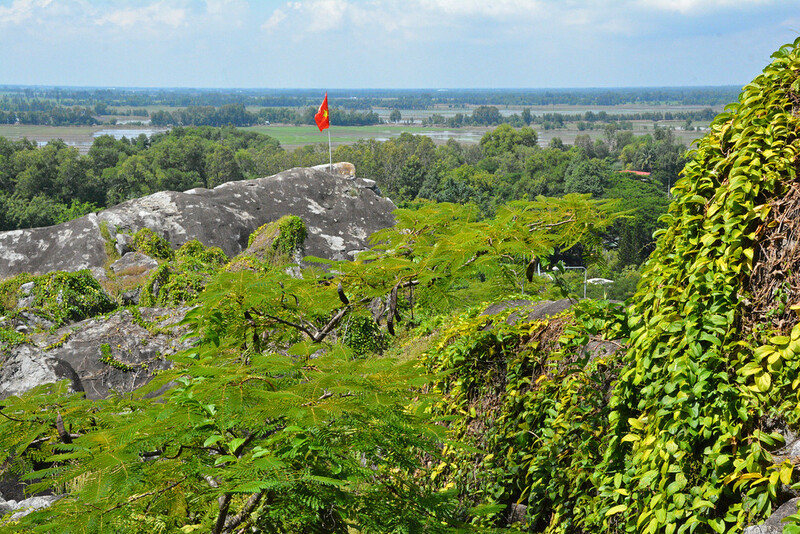 Vietnam looks so green and lush. It’s never been high on my travel list but maybe I’ll bump it up a few places lol. Gotta get me one of those hats! The hats are too cute. It’s really not a touristy thing either (well, there aren’t a lot of tourists in this region anyway); so many of the locals wear them as they carry on with their daily lives. Looks like an amazing place. Beautiful scenery, delicious food and great people. Definitely on my list. Thanks for sharing. The people in Vietnam are some of the nicest people we’ve met in all of our travels. We’ve never felt more welcomed in a country! Wow! It looks like you guys were able to really get in there and have a pretty authentic experience. I’m jealous! Absolutely! That’s what we loved about this tour. It felt really authentic and not a fast-paced touristy check list. Now is the time to visit! It’s still relatively undiscovered, so I recommend you go sooner rather than later before everyone else discovers how amazing it is! It was incredible how welcomed we felt, because they just aren’t used to seeing too many foreigners… YET!